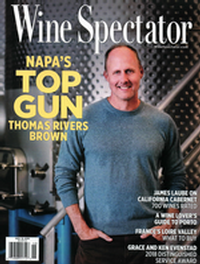 Thomas has earned his place as one of the most talented winemakers in the Napa Valley and maybe even on Planet Earth! Thomas was born in Sumter, South Carolina and attended the University of Virginia. He moved to the Napa Valley soon after graduating and started his career working for Turley Wine Cellars in 1997. He is a winemaker, focusing on high end Cabernet, for over a dozen wine brands including Schrader, Maybach, Revana, and Outpost. His wines have produced multiple perfect 100 point scores, notably "Old Sparky" by Schrader Cellars. Most impressively, TRB was awarded Winemaker of the Year in 2010 by Food & Wine and was the first American winemaker to earn 100 point scores from Wine Spectator. Wallis Family Estate currently has our wines produced at Thomas' new winery venture at Mending Wall Winery in St. Helena. We are extremely proud of what Thomas has done with our wines, and look forward to many more years of his creativity.